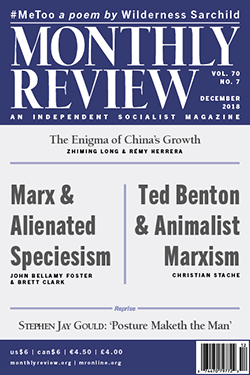 In many animal-rights circles, Karl Marx and a long tradition of Marxian theorists are to be faulted for their speciesist treatment of nonhuman animals and the human-nonhuman animal relationship. These criticisms typically neglect the larger historical conditions, intellectual influences, and debates out of which Marx's treatment of the human-animal dialectic arose—even though this is crucial to any meaningful understanding of his thought in this area. In response, this article assesses the historical-intellectual background behind Marx's arguments on humans and animals, placing it in the context of the influence exercised on his thought by Epicurus, Hermann Samuel Reimarus, Ludwig Feuerbach, Charles Darwin, and others. In the process, they explain how Marx's view of animals in the world came to be integrated with his theory of metabolic rift and his critique of capitalism.